Vintage Leaf Memories - Michael Langlois: Doug Favell: one amazing playoff night for the Leafs against Bobby Orr and the Bruins in 1974. Doug Favell: one amazing playoff night for the Leafs against Bobby Orr and the Bruins in 1974. Probably the best trade former Maple Leaf General Manager Jim Gregory ever made was acquiring Bernie Parent from the Philadelphia Flyers during the 1970-’71 season. Parent had come up with the Boston Bruins (in fact, I remember an magazine article at the time that referred to him as the new "Mr. Zero", the nickname of former Bruin Hall-of-Fame netminding great Frankie Brimsek), but really developed as a young goalie with the then expansion Flyers. When Gregory obtained Parent that season, it was, to me, a major coup. Parent was widely acknowledged as one of the emerging young goalies in all of hockey, and the Leafs had landed him. For a Maple Leaf fan back then, to get a young goalie entering his prime was unbelievable. They gave up Mike Walton, a talented offensive player to be sure, but one that was deeply unhappy playing for the Leafs. Given that Walton was refusing to ever play for the Leafs again, acquiring Parent, from a position of trading “weakness”, was amazing. A steal, I thought. The other part of the story is that the Flyers were willing to make the deal, in part, because they acquired young Rick MacLeish from the Bruins (Walton ended up in Boston) who would become a 50-goal scorer in the league. It worked out for everyone. The Leafs got a great young goalie. Walton helped the Bruins win the Cup in 1972. MacLeish had a brilliant career, and was instrumental in the Flyers winning two Cups in the mid-1970s. As importantly at the time, Philadelphia was able to swing the deal because they already had another young goalie. His name was Doug Favell. Now, Parent was the serious, hard-working, old-school stand-up style goalie. For his part, Favell (pictured at right with the Leafs) was the polar opposite. He was gregarious, confident—and colorful in the net, to say the least. The Leafs wanted a goalie and insisted on Parent to make the deal, so that left Favell, talented but more inconsistent and unpredictable, with the on-the-rise Flyers. Unfortunately, after a season and a half in Toronto, Parent determined he would be happier (and certainly wealthier) plying his trade for the new Miami Screaming Eagles of the fledgling World Hockey Association. I don’t think Parent ever played a game for that franchise. In fact, I’m not even sure that franchise ever played a game in the WHA. But Parent was gone. And it was a huge blow to the Leafs goaltending future. I do know that Parent played with the Philadelphia franchise in that league for one season. Then, at the end of the year, he wanted to come back to the NHL, only, he wasn’t interested in returning to Toronto. He wanted to stay in Philadelphia. So, the Leafs, who still owned his rights, were not exactly in a great position. Parent insisted on returning to Philadelphia. Gregory tried to do the best he could, and ended up with Favell in return. It was a frustrating time, but getting Favell was a lot better than losing Parent without getting another good goalie in return. And Favell had his moments in Toronto. He was one of those guys who could be absolutely brilliant, or maddeningly “off” his game. He was a flopper at times and athletic, an old lacrosse player, as I recall. 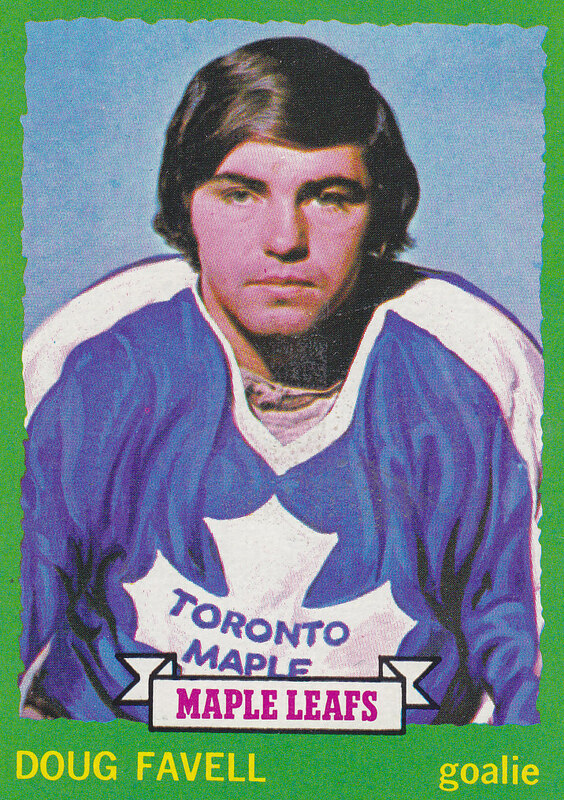 The best game I ever thing I saw him play with the Maple Leafs was one April night in 1974. The Leafs were playing the Bruins in the first game of the playoffs. The Bruins were still at their peak, with Bobby Orr in his absolute prime, Phil Esposito and other solid players like Johnny Bucyk and Wayne Cashman who had helped them win Cups in 1970 and 1972. In fact that spring, the Bruins were on their way to another Cup final, only they were beaten in a huge upset by the Flyers (and yes, Bernie Parent—ouch). But on this night in the old Boston Garden, Favell was stunningly good. He made stops from all angles and in every way you could imagine. Not exactly Dominik Hasek-like, but pretty close. He was scintillating, as Danny Gallivan, the great old Montreal play-by-play great, liked to say. He flopped around stopped the Bruins almost cold. Despite Favell’s heroics, though, the Leafs lost the game (the first game of the series) in Boston 1-0. I don’t remember the shots on goal totals from that night, but they heavily favored the Bruins. Favell was the best player on the ice—by far. And he wa splaying against the best player in the world in Bobby Orr. Unfortunately, that was the Leafs’ best shot. They lost the series in four straight, though they did take the Bruins to overtime in the last game of the series in Toronto. In any event, Favell was part of an unusual three-goalie rotation the next season under coach Red Kelly, sharing time with Dunc Wilson and the former Boston veteran Eddie Johnston. He was traded to Colorado and finished his career with the old Rockies. Favell was a character, and a good NHL goalie for quite a number of years. Unorthodox style, but Hasek made that acceptable later on. Favell was probably ahead of his time. Thanks for the 1974 memory! It's funny how you just watch the players on the ice when you are younger, and how that changes as you get older... I knew we traded Parent for Favell, but had forgotten it was his rights that brought Doug to the Leafs. That green border Doug Favell card is still in a box with other treasures from the past. When I got into my later teens, I always remembered thinking why did we ever make that trade (after facing Parent in so many series as the 70's wore on). Funny how 'acquisitions' and 'contracts' play such a big role in our discussions later in life. I had a lot of differing expectations for the season related to my anticipation of Burke moves that never transpired. I thought Connolly, Lombardi and Komi would all play to start the season, increasing their trade value and further 'stocking the cupboards' for our future pipeline. I expected the Marlies to be raided later in the season in order to fill the roles they actually obtained through demotions (and a trade), when the youngsters got their chance right away. It's what I hoped for, but not how I anticipated seeing them. A 'bubble team' was all I would commit to within the context of much lower ranking expectations from many 'experts', yet I hoped for Reimer's return within a better defensive system and was an early supporter of what I saw in McClement's game. Like you, Michael, I was ready to see Franson leave, but he really 'bought in' and has shown us that he is capable of more improvement while playing a significant role this year. Glad to hear Lupul was with Grabbo and Kuli in practice AND that Frattin was reunited with Kadri and MacArthur. I hope to see a broader base of offense as a result. Perhaps Grabovski will find some of that 'post-Chara-hit' guy in the pending series. Sure has been an interesting, compacted season!